We sewed this custom glove/sleeve together by hand. It even has conductive fabric in it for a better EMG reading. The 101 allows us to have an extra accelerometer on the base without using extra space. We also tampered with the idea of pairing the device with an app, and the builtin Bluetooth module on the 101 would be super convenient for that! The ExoMind Glove is a wearable device equipped with 7 accelerometers that are used to quantify forearm, wrist, and finger angles. Additionally, an EMG with conductive fabric electrodes is secured into the sleeve of the device to monitor muscle activity. The glove houses an Ardiuno 101 which runs an interactive program to prompt the user through motions in order to gauge range of motion and detect muscle activity which can be used by the physical therapist. Problem: In the United States, there are 143,000 individuals who have lost the use of their dominate hand due to a stroke. Of these, approximately 93,000 will have not successfully recovered the use of their hand after 6 months of treatment. Experts suggest that this lack of recovery is due to a lack of data. This lack of data contributes to poor success rates because (1) reimbursements for care at these centers is dependent upon quantifiable results, (2) the optimal intensity of training cannot be determined without specific data to quantify the patient’s progress, and (3) patients lose motivation without concrete evidence that they are making progress. Solution: In response, Purdue MIND created the ExoMIND Glove. This glove will meet the identified needs by (1) facilitating the creation of quantitative reports of therapeutic progress to allow for complete reimbursements, (2) allowing physical therapists the ability to identify and address specific deficiencies in the patient’s therapy, and (3) providing robotic rehabilitation solutions to patients struggling to regain use of their hands. Differentiation: Due to the narrow focus of these devices on patient recovery, other stakeholders, specifically the acute care center’s needs, have not been adequately addressed. The ExoMIND Glove presents the first attempt in this market to provide acute care centers with holistic analytical reports to track the progression of the patient’s recovery during acute rehabilitation care. Our solution utilizes seven velcro ring accelerometers and one fabric bipolar electrode EMG sensor unified within a single adjustable glove that slides over the user’s forearm and hand to allow ease of use. The glove is equipped with one EMG sensor sewn into the device with conductive silver fabric to comfortably measure electrical activity produced by skeletal forearm muscles. This EMG sensor is wired to a central housing unit (i.e. a breadboard) that is mounted on the top of the device. Five ring accelerometers housed in 3D printed units are mounted on each of the user’s finger tips to measure relative finger position. The remaining two accelerometers measure wrist motion by analyzing the position of one accelerometer on the back of the hand relative to an accelerometer in the central housing unit on the user's forearm. All accelerometers are wired to the central housing unit without impeding the user’s range of motion. 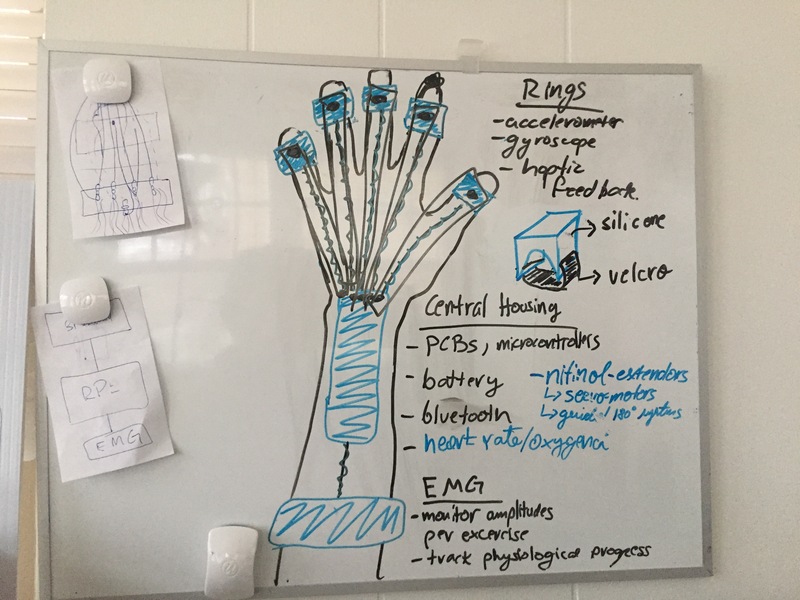 Contained within the central housing unit is an Arduino 101 which is paired with a software that implements an interactive program to walk the user through proper usage of the ExoMIND Glove. The circuitry of the accelerometers were designed and developed on custom printed circuit boards (PCBs) via Eagle software and sent to OSHPark to print for use. Due to these criteria, the MPU6050 was used for all accelerometers. The accelerometers detect changes in the angle of each fingertip with respect to a baseline position of a closed fist by using a reference accelerometer fastened to the backside of the patient’s hand. These values must be used to obtain a measure of the range of motion of each individual finger such that a physician or physical therapist may quantify and personalize the therapy over time by identifying which fingers or types of exercises need more direct attention. The user needs a simple and interactive program to walk the user through proper usage of the device to ensure accurate readings and clearly displayed results. The analog front end (AFE) and bipolar electrodes of the EMGs were designed and developed on custom printed circuit boards (PCBs) via Altium software. The AFE and electrode design had to be small enough to be comfortably worn within a wrist brace encapsulating the forearm, and to filter frequencies outside the 70 Hz - 1590 Hz range while amplifying the differential signal by 1000x to meet design specifications. The dry electrodes consisted of medical grade silver plated (76%) nylon (45%) elastic fiber fabric sewn into the brace. Functionally, the EMG monitors specific muscle groups active during exercises of interest during upper limb rehabilitation of stroke patients. 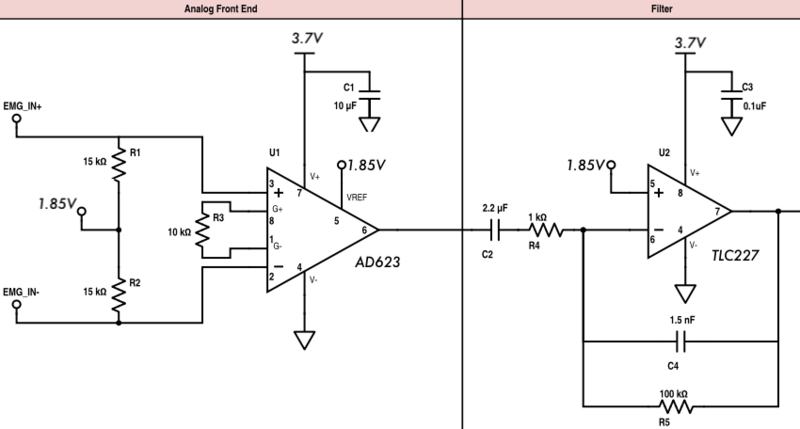 To accomplish this, Purdue MIND designed an AFE with the AD623 instrumentation amplifier and the TLC227 operational amplifier powered by a 3.7V lithium ion polymer battery and a voltage divider to effectively provide a reference voltage (i.e. 1.65V), remove common noise, filter via a bandpass active filter and amplify the bioelectric signal being recorded on muscle fibers such as the pronator teres, flexor carpi radialis, palmaris longus, and the flexor carpi ulnaris (Fig. 2). Obtaining the bioelectrical signals from the forearm allows for the quantification of the patient’s muscular strength. These values must be used to obtain a measure of muscle activity per exercise such that a physical therapist may quantify and personalize the therapy over time by identifying which areas and exercises need more direct attention. The user must need a simple and interactive program to walk the user through proper usage of the device to ensure accurate readings and clearly displayed results. In the United States, 795,000 people suffer from a stroke every year . Approximately 318,000 of these patients will need rehabilitation at an acute stroke rehabilitation center . After 6 months of care, 65% of the patients who lost hand dexterity due to stroke still have not regained the ability to carry out common daily tasks . After visiting varying rehabilitation centers, interviewing rehabilitation experts, and conducting research, a multidisciplined student team from Purdue MIND learned that the effectiveness of the therapy often plateaus due to a lack of quantitative data . This lack of data contributes to poor success rates because (1) reimbursements for care at these centers is dependent upon quantifiable results, (2) the optimal intensity of training cannot be determined without specific data to quantify the patient’s progress, and (3) patients lose motivation without concrete evidence that they are making progress. In response, Purdue MIND students mobilized into three multidisciplined design teams (i.e. electricity, material, and programming) and created the ExoMIND Glove. This glove will allow more patients to regain functional use of their hands after stroke-induced injury by (1) facilitating the creation of quantitative reports of therapeutic progress to allow for complete reimbursements, (2) allowing physical therapists the ability to identify and address specific deficiencies in the patient’s therapy, and (3) providing robotic rehabilitation solutions to patients struggling to regain use of their hands. Two classes of sensors were utilized to accomplish these purposes: inertial measurement units (IMUs or accelerometers) and electromyograms (EMGs). The accelerometers gauge the percent increase in the range of motion for the wrist as well as each individual finger. The EMGs allow for a quantitative measurement of muscle activity so that a detailed record of the flexion and constriction strength for each finger over treatment period may be created. The final design integrates a total of eight sensors (i.e. 7 accelerometers & 1 EMG) to a microcontroller to quantify the percent 180° range of motion achieved by the fingers and monitor muscle activity via a soft wearable dry-electrode EMG integrated into a brace. The ExoMIND Glove is the first technology capable of providing patients who were otherwise unable to regain use of their hand by current therapies offered by rehabilitation robots while allowing acute rehabilitation centers the ability to gain full reimbursement for their services. "Stroke Facts", Cdc.gov, 2017. [Online]. Available: https://www.cdc.gov/stroke/facts.htm. [Accessed: 29- May- 2017]. "Rehabilitation Therapy after a Stroke", Stroke.org, 2017. [Online]. Available: http://www.stroke.org/we-can-help/stroke-survivors/just-experienced-stroke/rehab. [Accessed: 29- May- 2017]. B. Dobkin, "Rehabilitation after Stroke", New England Journal of Medicine, vol. 352, no. 16, pp. 1677-1684, 2005. These oscilloscope outputs are from the first time we breadboarded our EMG design and tested it. This is the setup unattached from the sleeve. Biomedical Engineering Student at Case Western Reserve. Focus in electrical engineering and medical devices.